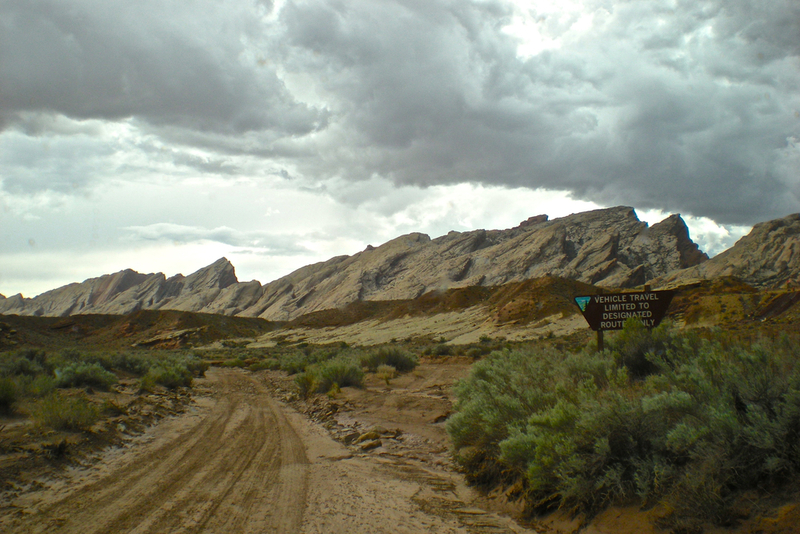 The San Rafael Swell adventure was a proof of concept journey in many ways. Tom and I had been discussing changing our Jeep lifestyle to more of an overlanding concept from the “sport wheeling” paradigm that had been our practice as of the previous few years. This shift was really a return to the original reasons we each bought a Jeep Wrangler many years ago. This reason was to have the ability to easily travel into remote areas for camping and exploring the backcountry. The vast and beautiful natural areas of our nation has never failed to bring us unequivocal experiences and an ever-growing appreciation for the land and people we encounter. In the intervening years since this particular journey, vehicle dependent overland travel has thankfully gained serious momentum in North America. Tom and I had been to Utah on four wheel drive trips in the past, but this journey would be a test of some new equipment, concepts, and planning. The red rock arches, blue skies, and pictograms of Utah’s San Rafael Swell would become the groundwork of Flatwater Overland. Not to mention a life changing experience for a friend of mine, Eric. What was to be unique about this journey into the west was the duration and the purpose. While exploring the vast uplifted sandstone dome of the San Rafael Swell, we purposed to be in the desert for roughly six days with two days travel time on each end. This would be the longest we had continuously sustained backcountry camping (we had planned to camp for all 10 days of the journey), and we had a specific set of goals to reach and places to document with photographs. Short wheelbase vehicles like the Jeep Wranglers we would be driving are obviously limited in cargo capacity but also make easy work of the technical terrain we were expecting. In order to compensate for the lack of cargo area and to sustain camping for 10 days, a serious solution was needed. 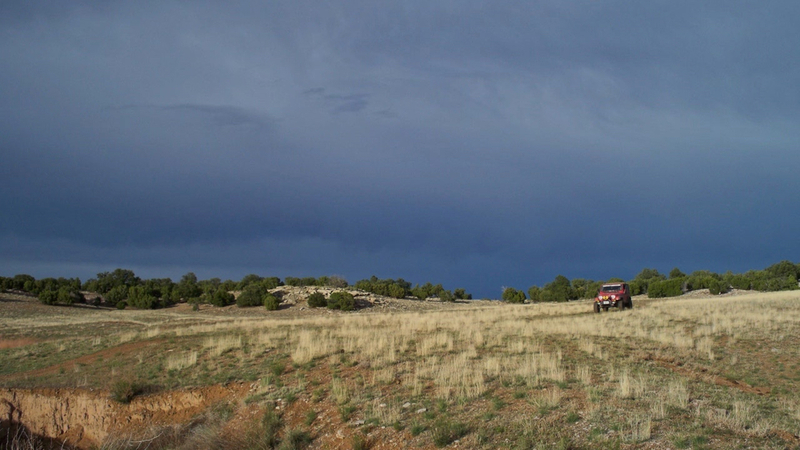 An off-road trailer was the sustainment concept that we utilized for this journey, and worked so well that it has since changed hands once and spawned a second generation design. The first design became known as “the trailer experiment that went horribly right”. This overland vehicle configuration was to become the Flatwater Overland model for future journeys. First on the San Rafael bucket list would be Black Dragon Canyon. The goal was to explore a canyon that carried a reputation for technical four-wheel-drive challenges that changed with each rainstorm, and ancient pictograms. The most famous is a pictograph which looks fascinatingly similar to a pterodactyl dinosaur and is known as the “Black Dragon”. 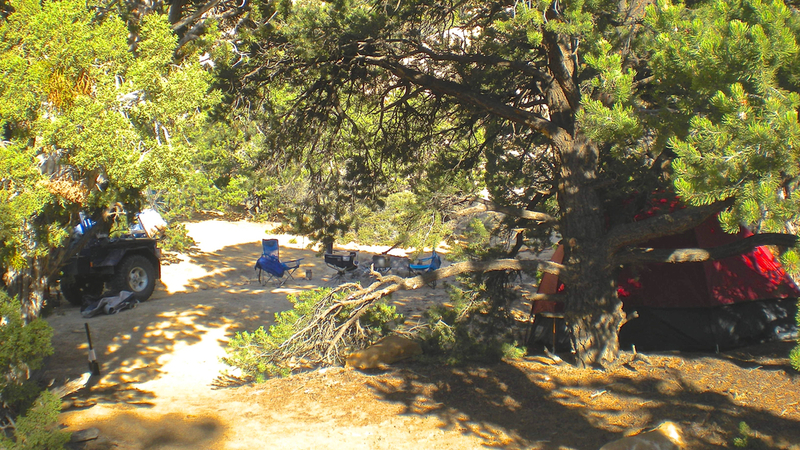 The first night in the Swell, we camped in a side amphitheater in the Buckhorn Wash. There had been some spring thunderstorms coming through the high desert, and the ground was quite muddy except where the soil was extraordinarily sandy. That night, the first campfire illuminated the high sandstone walls of the wash as embers from the fire pit rose gently to the sky and appeared to become part of the starry expanse above. It had been dark when we pitched camp, so the sunrise illuminated the spectacular canyon and filled us with nearly uncontrollable anticipation of the day’s explorations. Before we were able to delve down into Black Dragon Canyon, we examined several points of interest along the way to include a set of dinosaur footprints in the sandstone of Buckhorn Wash along with the “Rain Angels” petroglyphs right along the BLM road. We crossed the San Rafael River and onto the expanse of Limestone Bench which made for some spectacular photography. The trails led us east to Jackass Flat and down to the Black Dragon Canyon. Most of the roads and trails we had traversed to this point were quite mild and accessible to most stock high clearance vehicles. As we continued down into the canyon, the terrain become more difficult and is not somewhere to be during a storm as there was evidence of catastrophic flash flooding all around us. During the time we traversed this trail, it would rate a Class 5 on the Flatwater Overland Trail Rating Chart. The pictographs and petroglyphs of the lower Black Dragon Canyon were awe inspiring and words simply cannot capture the emotion of seeing and touching art carved into the landscape thousands of years ago framed in by massive stone walls. We exited the canyon and crossed under I-70 west of Green River and intended to head south along the eastern edge of the Swell in the shadow of a spectacular formation of angled cliffs that rose above the desert like a row of massive saw teeth shrouded in mist. The thunderstorms began breaking down on us and flooding the improved trails. Discretion is the better part of valor when overlanding, so a discussion ensued over the radios on how to modify our travel plan. We decided it was unwise to continue south, so we headed back to I-70 and drove back up into the heart of the Swell. The trails we followed ultimately led us to a campsite in the middle of a large grassland east of Cane Wash on the Rattlesnake Benches. We pitched camp as the sun set and went to sleep with clouds lit by lightning on the horizon shimmering through the tent walls. Morning once again brought incredible vistas of red buttes and hills framing each horizon. After breakfast and some photography, we decided to head towards Fix-it Pass and begin our list of trails. The Devil’s Racetrack section actually included several trails and days of our journey, but the most interesting and anticipated was the Devil’s Racetrack trail itself. We had previously tackled Fix-it Pass and it did provide some amazing scenery and canyon running, but the one serious section of technical driving around large boulders and washouts only served to encourage us to tackle more technical trails. We remained unsure as to the type of terrain that actually could be traversed with the trailer and YJ despite all the design considerations, but we would soon learn that if the Jeep could go, so would the trailer. We looped back towards I-70 through winding canyon trails to the head of The Devil’s Racetrack and some more pictographs. We kept thinking that we would get tired of the canyons and red rock, but each turn of the trail revealed some geologic wonder and everything was new in the world once again. Each stop we made provided more photo opportunities and some natural feature to discuss. The arches and windows visible from every trail fascinated us. Some were small and accessible like Dutchman’s arch, which seemed to make them even more wondrous when taken in context of large arches like Slipper Arch. Of course, we saw even more pictograms that left nagging questions in our minds about who or what they represented. Stoic elongated figures standing in formation, rows of marks counting the passage of time or accounting for harvests, dancing warriors, fantastic alien figures along with familiar animal designs seemed to accompany us on each trail. 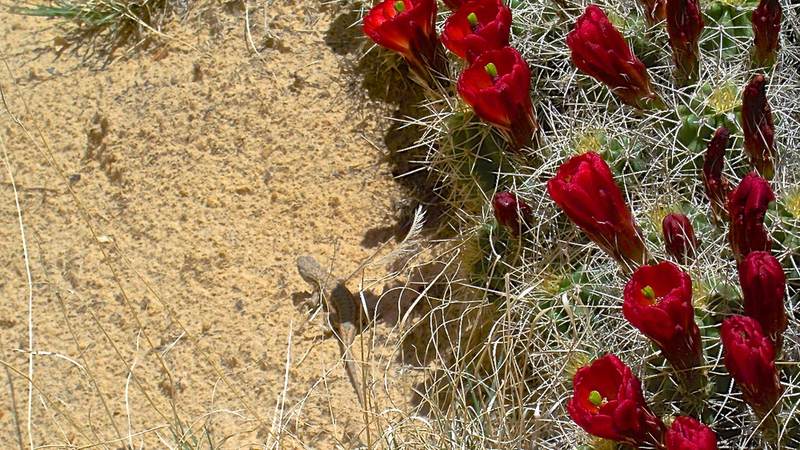 Even the desert life about us seemed to resonate with the fantastic. 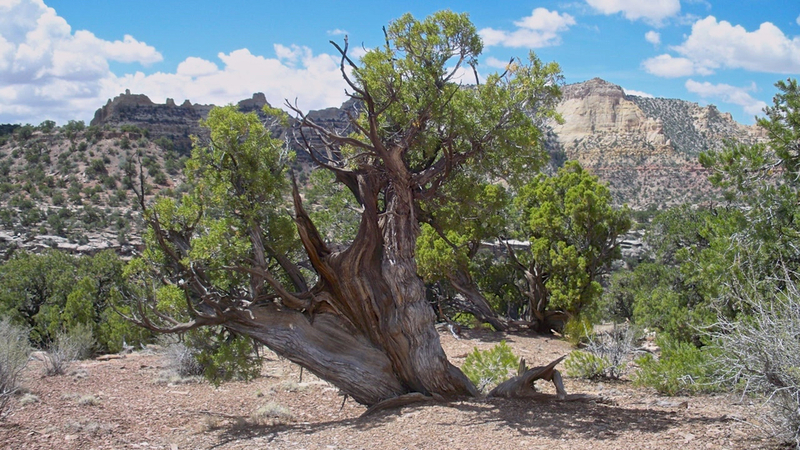 Juniper trees twisted into horn-like spikes, cactus hugged the ground and sprouted fiery blossoms, and wildflowers levitated on wispy stems above cryptobiotic soil alive with algae and microbes. The Devil’s Racetrack entrance sported BLM signs warning us on the difficulty of the trail and the personal danger we were placing ourselves in. We had a few reservations on the trafficability of the trail with our trailer, and Tom’s Wrangler did not have any locking differentials. We were, however, as technically prepared as we could be with recovery equipment and trail driving experience. Turning around would always be an option. 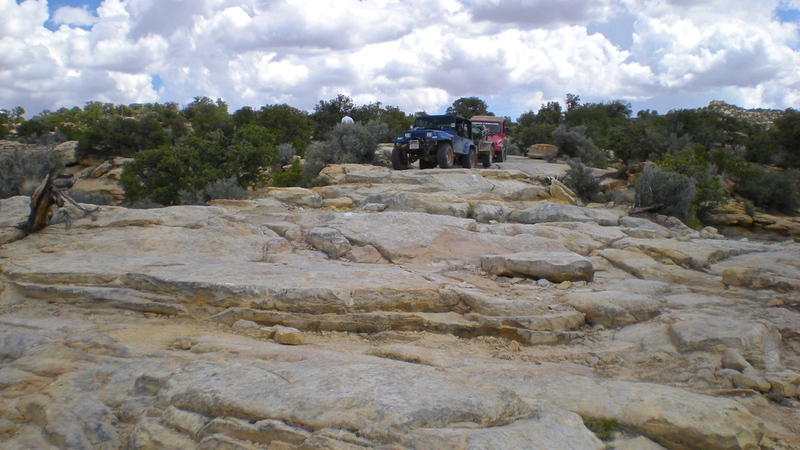 It turned out the Devil’s Racetrack had one section of around 400 meters in length that was precarious and featured a significant set of stair-step ledges that earn this trail a solid Class 7 on the Flatwater Overland Trail Rating Chart. The rest of the trail was quite mild and continued to provide beautiful vistas and views down into deep canyons and miles to the horizons. This trail was definitely worth the difficulty, but may certainly cause damage to stock 4x4s or longer wheelbase vehicles. The difficulty of this section was evidenced by a smashed cooler we found still containing ice and some intact food. Being the desert rats that we are, we were able to salvage some undamaged gourmet hot dogs, condiments, and a few still-cold beers. Some higher speed “rallying” with the trailer on sand in the canyon after finishing the Devil’s Racetrack ended up bending the light duty tongue on the trailer. We determined some repair to the trailer tongue would be necessary before tackling the rest of the Swell. We finally conducted some fabrication and repairs in the parking lot of a mining equipment company in Castle Dale. They were nice enough to sell us the needed steel tubing, and pre-drill it for frame bolts. They were also amazed when we finished the repairs by welding on the trailer hitch receiver with the Mobi-Arc onboard welder installed on the YJ in their parking lot. Since the day was getting late at this point, we camped at the Millsite State Park above Ferron before heading back into the Swell. The improved campsite at the lake allowed for much appreciated showers but not appreciated neighbors. 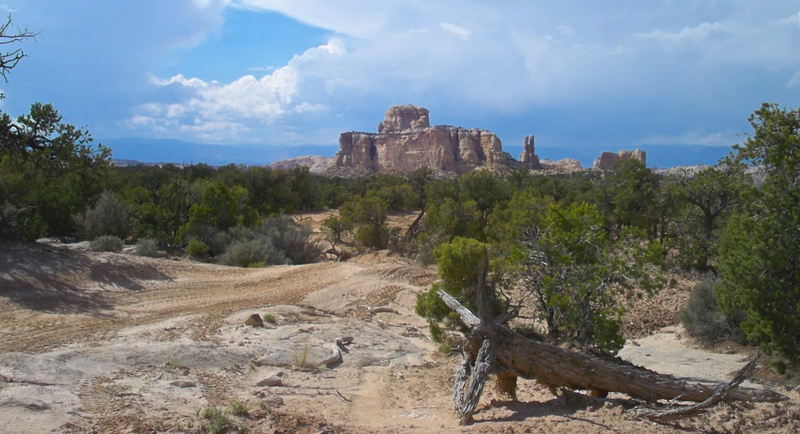 The Ghost Rock section of the San Rafael Swell Journey featured several very interesting trails with enough technical sections to hold our driving interest and provide jaw-dropping scenery at every turn in the canyons. The Eva Gonover trail seemed to go on forever tracing deep canyons and weaving around washouts. 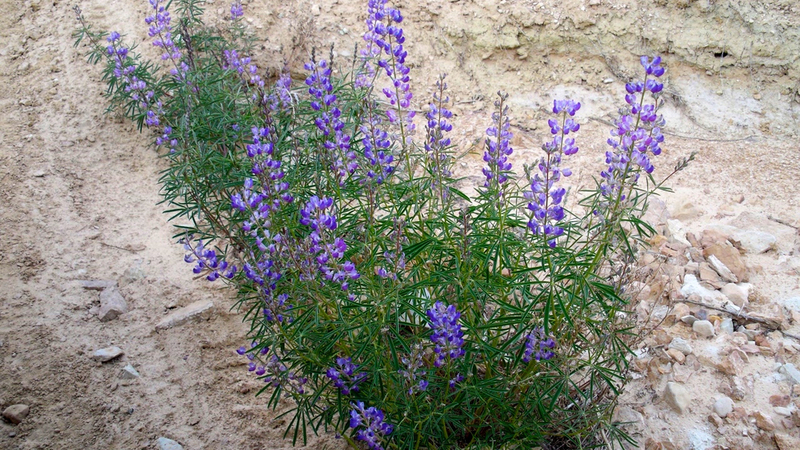 The recent rains provided more vibrant wildflowers as well as washouts, and the rock formations which made up the serpentine canyons and buttes kept us busy with the cameras. Eric was exploring and photographing every stop we made. The scale of the canyons and rock formations was humbling when we walked away from the vehicles and looked down on the trail from a hilltop. 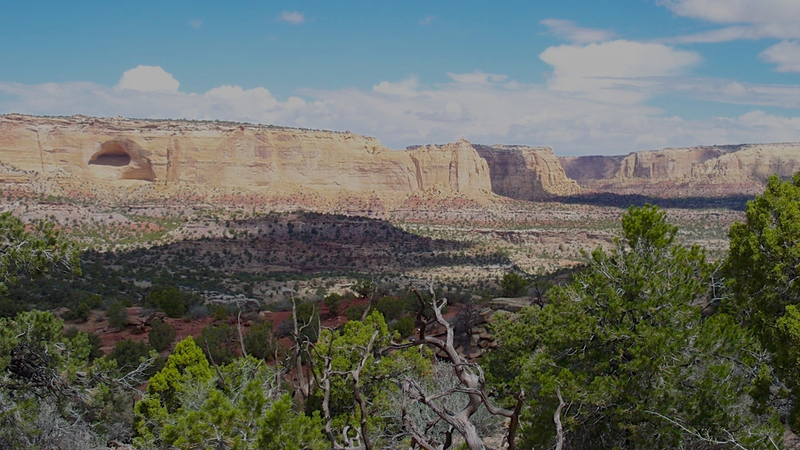 From the right perspective, sometimes the whole canyon could be seen spilling out to the north with forested mountains in the distance with a deep floor below the Jeeps still shimmering from runoff. After reaching I-70, we proceeded to drop into Eagle Canyon and pass far under the arched spans of I-70 to access the Swazey Cabin and Ghost Rock area. The topography around the Swazey Cabin was definitely worth some hiking time and revealed some wonderful overhangs and caves in the vicinity. We also discovered a juvenile rattlesnake near a spring. The pictograms in this area were amazing. One in particular looked like a devil-horned warrior carrying a round shield into battle. There was plenty of dispersed camping in this area as well, so we decided to camp. 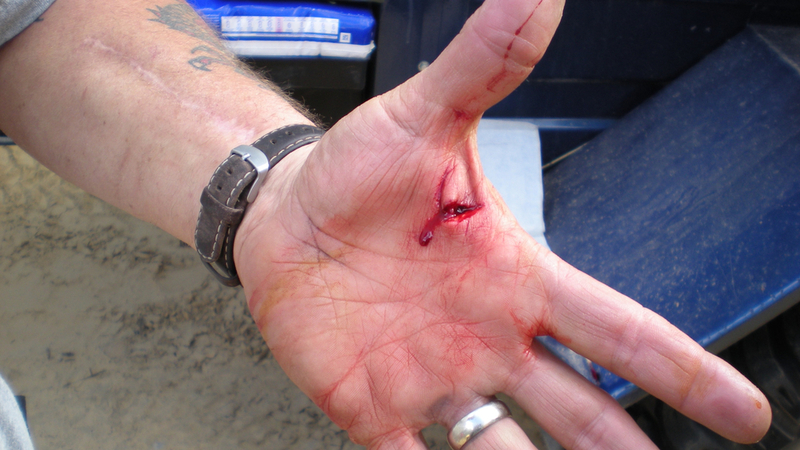 Unfortunately, Tom injured his hand that required some field sutures when pitching camp. It was quite dark when we were finally able to make dinner and settle down. As we reflected on the day around the campfire, we noticed how our shadows were cast long and stoic against the sandstone. The shadows looked eerily like some of the pictograms we had seen in earlier days. Was the answer to the meanings of the shapes really this simple? We made a few final trail explorations south of I-70, and ended up at the Globe Copper Mine site which featured some fascinating rock formations and well preserved mine shafts. The history of the area was intoxicating, especially after waking the morning before on the edge of a vast canyon complex as the sun rose like thunder, flooding the arroyos with light. 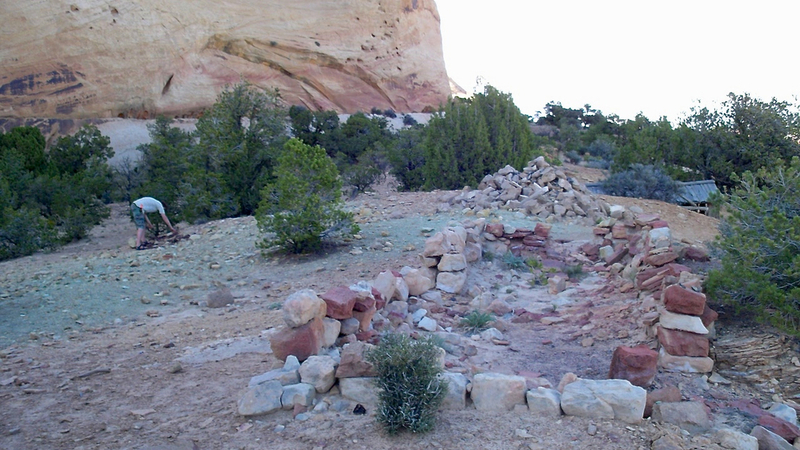 We made camp that night near the Sego ghost town east of the Swell and north of Moab. 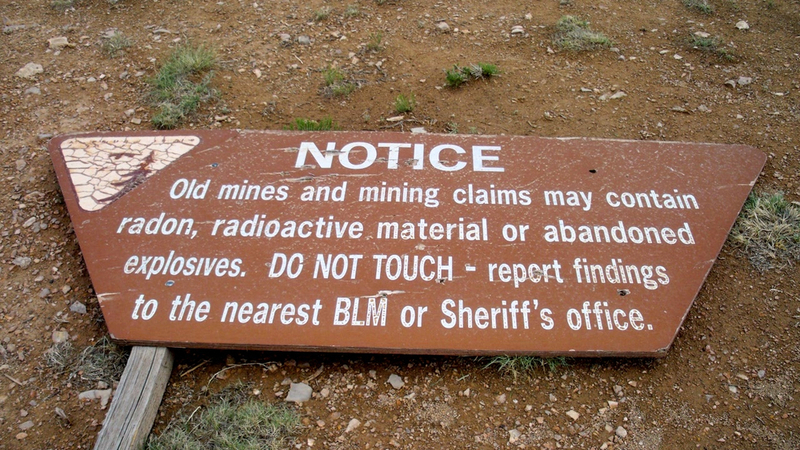 Some more pictograms greeted us as well as the ruins of a coal mining outpost as we decided on one last camp in Utah. With desert visions and discussions of the next adventure on our minds, we soaked in the campfire before heading back home.